Type 2 diabetes mellitus is increasing significantly in westernized, industrialized societies as the populations become more obese, sedentary, and older (1–5). Four of five persons with type 2 diabetes will die of cardiovascular diseases (CVDs) (1, 2, 5–7). Many factors contribute to increased CVD in persons with diabetes. These include hypertension, dyslipidemia, platelet hyperactivity, endothelial abnormalities, and hypercoagulability, as well as hyperglycemia, microalbuminuria, and hyperinsulinemia (1–9). The Multiple Risk Factor Intervention Trial (4) (MRFIT) followed over 5000 diabetic persons were followed for 12 year and compared them with over 350,000 persons without diabetes. The risk of cardiovascular death at the 12-year follow-up was approximately three times higher in diabetic men as compared with their nondiabetic controls, regardless of age, ethnic group, cholesterol level, systolic blood pressure, or tobacco use. When patients had optimal control of systolic blood pressure and were nonsmokers, the relative risk of CVD was still 2.5 times higher in the diabetic men. 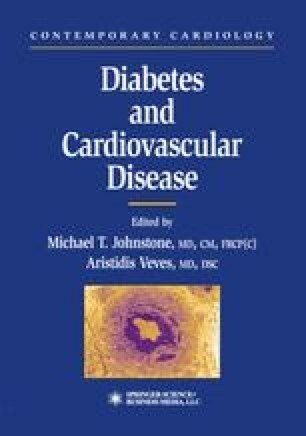 The MRFIT study confirmed that diabetes is a strong independent risk factor for CVD mortality above the risk incurred from hypercholesterolemia, systolic hypertension, and cigarette use. In addition, it confirmed that hypercholesterolemia, systolic hypertension, and cigarette smoking are also important independent predictors of mortality in men with and without diabetes. The presence of one or more of these risk factors had a greater impact on increasing CVD risk in diabetics than in nondiabetics.